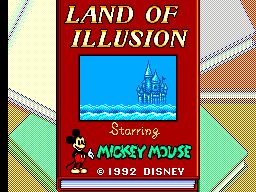 Land of Illusion Starring Mickey Mouse, known in Japan as Mickey Mouse no Mahou no Crystal (ミッキーマウスの魔法のクリスタル), is a Sega Master System and Sega Game Gear platform game featuring Disney's Mickey Mouse. It is a sequel to the 8-bit version of Castle of Illusion, and can be seen as the 8-bit counterpart of World of Illusion. During development it was known as Mickey Mouse II. Land of Illusion was followed by Legend of Illusion. Main article: Land of Illusion Starring Mickey Mouse/Magazine articles.